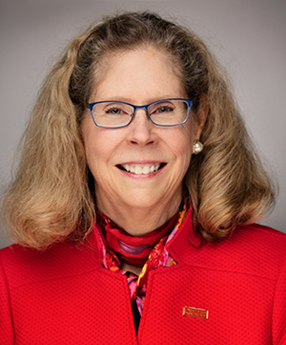 Dr. Wendy Wintersteen became the 16th president of Iowa State University on Nov. 20, 2017. The first woman to hold the university’s highest office, Dr. Wintersteen has served Iowa State for nearly 40 years in several capacities. Dr. Wintersteen completed her doctorate in entomology at Iowa State. Rising through the ranks to become a professor of entomology (with a brief stint at the U.S. Dept. of Agriculture in Washington, D.C.), she assumed a number of administrative roles in extension and the College of Agriculture and Life Sciences (CALS). Most recently, Dr. Wintersteen served for eleven years as the endowed dean of the College of Agriculture and Life Sciences and director of the Iowa Agriculture and Home Economics Experiment Station. During her tenure, CALS rapidly increased enrollment to become the third largest college of agriculture in the nation, research grants increased markedly, awards for teaching excellence grew, and the college achieved a 98% placement rate for its graduates. Dr. Wintersteen serves on the Board of Directors of the Big 12 Conference; the University Innovation Alliance (UIA), a coalition of 11 public research universities aimed at making college degrees more attainable for underrepresented students; the Cultivation Corridor, a regional economic initiative to establish Iowa as the global center for excellence in agbiosciences, advanced manufacturing, and technology sectors; and Bankers Trust. She is a member of the Association of Public and Land-grant Universities (APLU) Council of Presidents and was selected to serve on the APLU Research Intensive Committee beginning in 2019. She is part of the Governor’s STEM Advisory Council Executive Committee and the Business Education Alliance. Dr. Wintersteen holds a bachelor’s of science degree in crop production from Kansas State University and Ph.D. in entomology from Iowa State University.